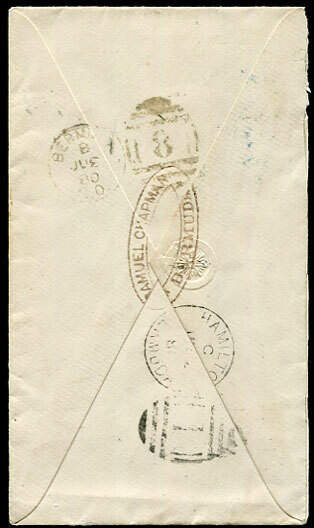 1953 (FE 24) cover to Paget East with 1c, 7c,10c franking pmk'd Ciudad Trujillo, reverse Paget arrival. 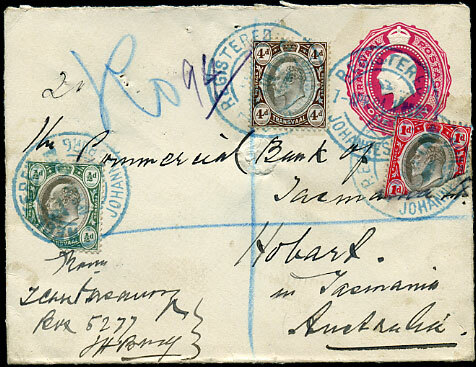 1880 cover with QV 1d pmk'd St. GEORGES K3 "2" duplex dated B/JU 2 80 (during 1st period blue ink DE 1879 to JU 1880) to Eden Grove, Warwick, reverse SAMUEL CHAPMAN/BERMUDA sender's oval with HAMILTON K3 "1" C/JU 2 80 transit and K3a "8" arrival dated B/JU 3 80. 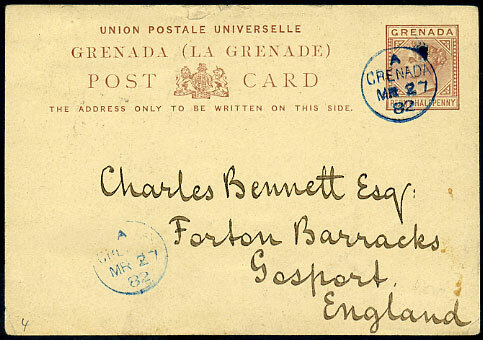 Ex LUDINGTON. 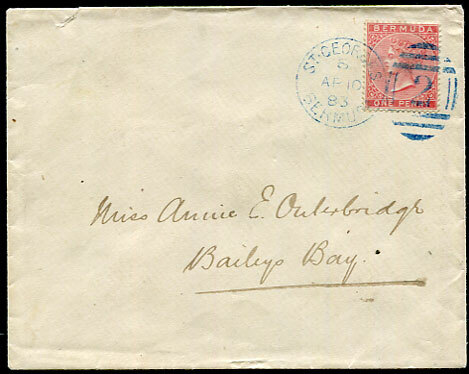 1883 local cover to Annie Outerbridge, Baileys Bay with QV 1d pale rose CC wmk (SG.1) tied ST. GEORGES K3 "2" duplex dated B/AP 10 83 in blue ink (LRD), no backstamps. 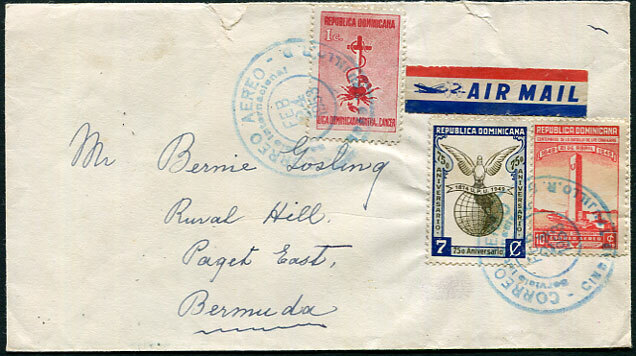 Ex LUDINGTON. 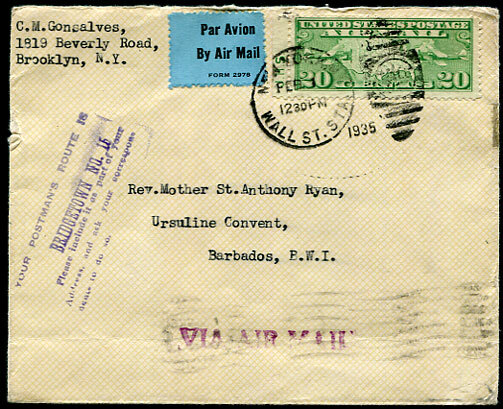 1935 cover to the Ursaline Convent, Barbados with USA 20c Airmail pmk'd WALL ST. STA. 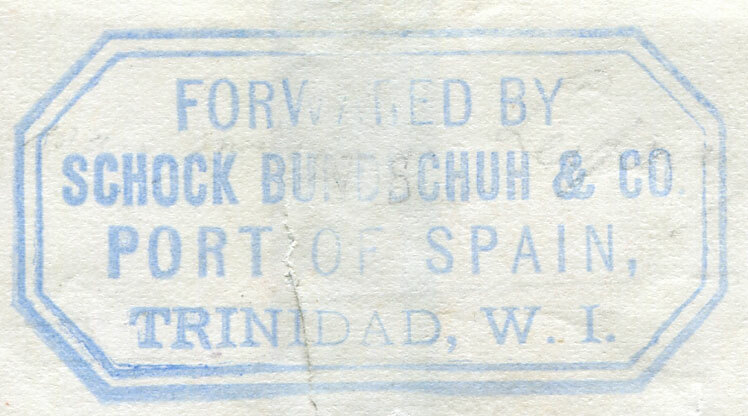 dated FEB 1 1935, on arrival bluish 5-line instructional handstamp "YOUR POSTMAN'S ROUTE IS/BRIDGETOWN No.15/Please include it as part of your Address, and ask your correspon/dents to do so." 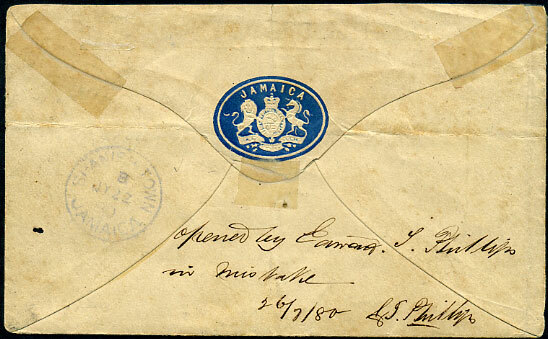 (Proud Type 145, this being the only recorded date for No.15 instruction). 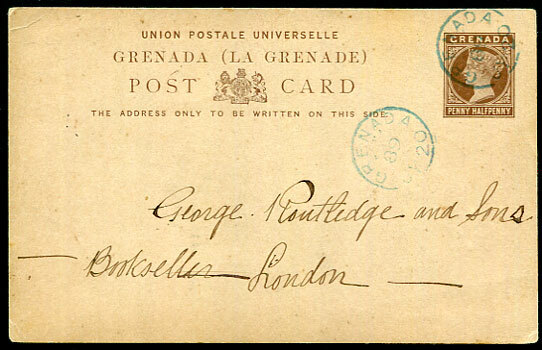 1882 QV 1½d pale brown UPU Post Card to Forton Barracks, Gosport pmk'd blue A/GRENADA/MR 27 82 cds, rarely seen. 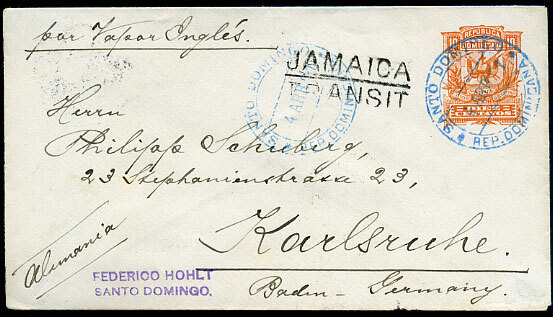 (A below right leg of M) alongside address panel on 10c orange PSE pmk'd blue SANTO DOMINGO 4 ABR 91 to Karlruhe, b/stamped fine strikes Kingston 3 N/AP 6 91 sqc and Karlsruhe 24.4.91 arrival. 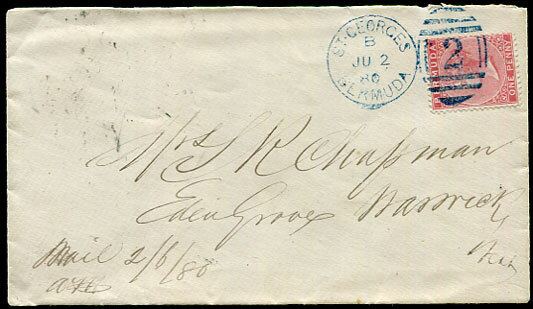 (2nd Type) in blue dated 23 FE 91 on REGISTERED LETTER receipt. 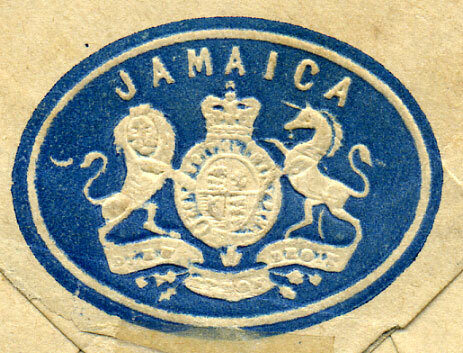 (Type O) in blue ink indistinctly tying QV 2d Crown CC (SG.9) on OHMS Royal Arms stationery cover to Kingston dated B/JY 22 80. 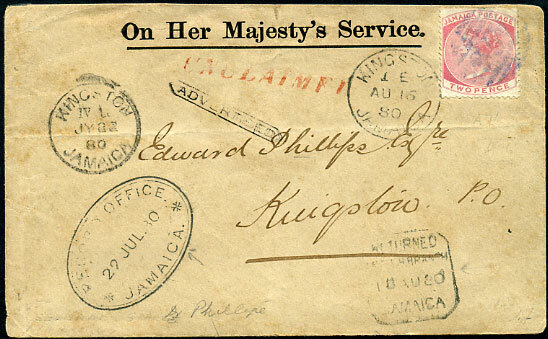 On arrival ADVERTISED, UNCLAIMED with RETURNED LETTER BRANCH 18 AU 80 handstamps. 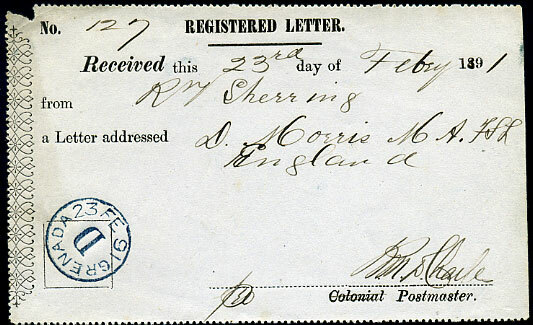 (D/R) in blue ink dated 7 APR 04 on KE7 1d pink PSE with added KE7 ½d, 1d, 4d to Hobart, Tasmania. 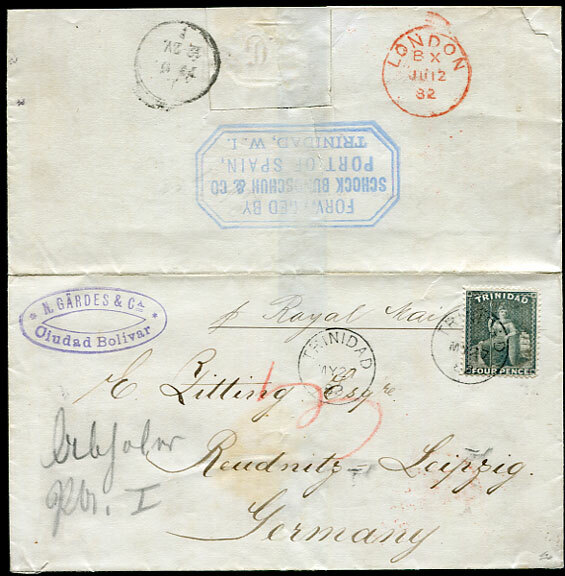 Both low values with very large part of stamps removed, one by scissors, as if deliberately to hide previous (cancelled) use.